MASCI VE 2 (Italian Catholic Scout Movement Adults - JOJO Venice Group 2) in collaboration with the parish of San Giovanni e Paolo in Venice hosted a lovely Christmas market capturing the spirit of the beautiful words of Mother Teresa of Calcutta. From January 6th to 8th in the hall of St. Thomas Church St. John and Paul's work, the spirit of solidarity, generosity, enthusiasm and the cleanliness of mind of many people has collected $ 1,000 that will go to "Le Restaurant des Enfants de la Rue" in Phnom Penh. Fra Angelo, to whom we extend a warm thanks, as well as allowing the construction of the market in the parish hall has given for the same cause the bids received for the crib. Early in February we send in Cambodia the full amount collected: 1230 euros. With this figure we can provide over 2,000 hot meals daily to 200 children who attend our restaurant. 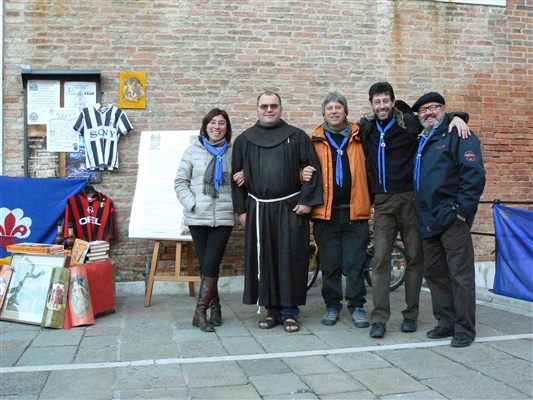 Many thanks to the group Masci JOJO Venice 2, Fra Angelo and anyone with a small gesture made this possible.